Looking for removal of asbestos removal in Basingstoke? Here at PS Environmental we are HSE licensed, so you can be confident that you are in safe hands when you choose us for. If you require further information, please don't hesitate to call us today and speak to our friendly team. We are experts in asbestos removal and cater to all domestic and commercial clients with asbestos problems, removing it safely and efficiently. 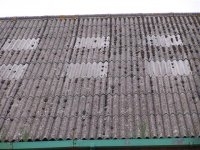 As asbestos removers in Basingstoke, we have years of experience in the industry. We operate throughout Basingstoke, Hampshire and throughout the whole of the UK and can provide a reliable, professional and efficient service to each and every one of our clients. We have been established for over 9 years and in that time we have developed an enviable reputation for our dedication to customer satisfaction. We have obtained a large client base since opening, all of which recommend us highly for the service we provide them. Over the years we have had many customers, both domestic and commercial, who are extremely satisfied with the service we provide. This has helped us maintain a client base of respected customers which have recommended us time and time again. For more information about the service we provide, or for some helpful advice, please feel free to call us on 0125 688 0110 or 07930 310 686. Alternatively, you can email us at pmsenvironmental@aol.com. We look forward to hearing from you.